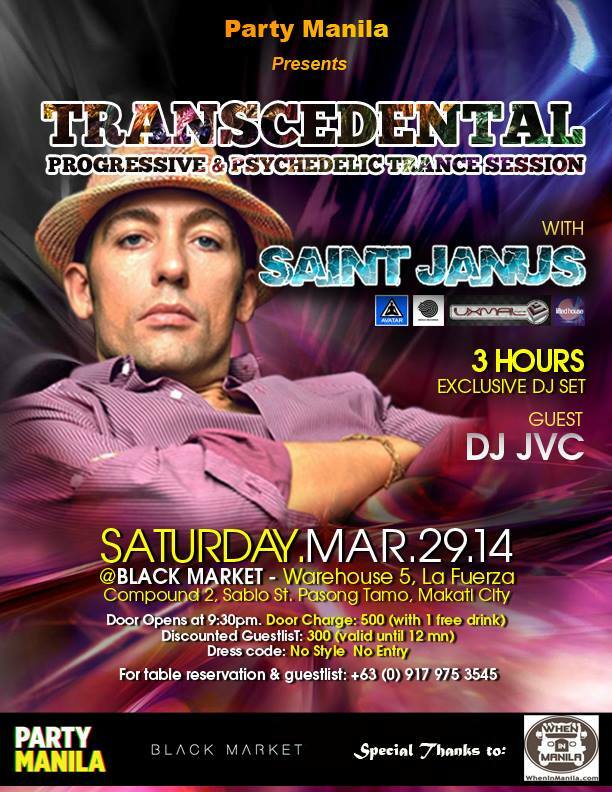 DJ JVC GIG: Transcedental: Progressive and Psychedelic Trance Session with SAINT JANUS & guest DJ JVC – DJ JVC | DJ for hire in Philippines | DJ Mixtapes, Clubbing and Music Festivals in Manila, Philippines. International DJ and Producer Saint Janus have more than a decade of DJ experience focusing on the progressive and psychedelic trance scene. Hailing from Copenhagen, his early musical experiences and influences had been rooted in organizing hundreds of trance event and publishing Clubbing Magazine in Denmark. Janus is known to combine heavy analog equipment and very select professional digital software lending a very organic sound to his studio productions. He has had releases with Iboga Records (DK), Uxmal Records (MX), Lifted Records (DK) and has an upcoming release with Avatar Records. 2014 will also be the year that Janus will launch his own project, the Hallugrapper, which is already garnering a massive interest from the underground trance scene. His current projects lies with the development and evolution of alternative trance music which will pave way for something different and something new in the underground trance scene. >>>> DJ JVC, underground EDM/trance DJ and former resident DJ for Distillery and Izumi will be the guest for this event. He started doing mixtapes in 2009 and in 2010, DJ JVC started playing in some bars in Metro Manila, such as Distillery (Makati) Izumi, HQ, Pablo’s, Relik and Olive Tree Kitchen and Bar to name a few. He is also actively collaborating with other DJ’s in the country to discover other talents to come up with something that can bridge both underground and mainstream sound.